Well, not really. Sorry for the click-bait title, but I am hoping to get Microsoft’s attention and catch them in a “duh” moment. The whole idea of Continuum excites me. Three days after I powered on on my Lumia 950, I had a USB-C to Display Port adapter (only 1366 x 768) connected to an extra 23” monitor to see what all the fuss was about. While the resolution was not ideal, and my phone was losing juice quickly (even while sitting on a wireless charger) I understood how and why Continuum could become a very important thing. I would have loved using this 15 years ago when I regularly traveled multiple times a week to different company sites. Back then, when I found someone willing to listen to my rambling, I would start talking about how my Palm Pilot could be plugged into a dock connected to a $200-$300 dumb terminal (when laptops cost $1000+), allowing me to work more efficiently on a big screen. Obviously, I was ahead of my time. My end use needs have changed since then, but not the excitement of transforming my pocketable device into a full blown computer. And this is where I think Continuum’s problem currently lies. Everyone loves the concept and might want to try it out. But no one has really come up with some solid end use scenarios. That’s going to keep Continuum and the Display Dock in “Geek Status” limbo for the time being. My suggestion to Microsoft; “throw as many rubber tipped darts at the pegboard as you can and see if you can get a couple to stick”. Then you can market real reasons for people to take interest in Continuum, along with its byproduct Windows Mobile. Sure, you can have a kiosk, with a fixed monitor, keyboard and mouse setup at your office or home all the time, but does that really make sense. Is that really how people envision using Continuum? And all those cables. Or, would they prefer to be mobile, portable, flexible, cable minimalistic, as much as their smartphones. I know you can use Continuum wirelessly, but until that experience is every bit as good as wired, meaning; zero lag, zero disconnects, zero stutters, zero freezes, then we are going to be stuck with a few wires for now. The Display Dock, as it’s aptly named, is full of ports. It’s got an HDMI Port, a Display Port, (2) USB-C ports (power & phone input) and (3) USB-2.0 ports. All those ports. 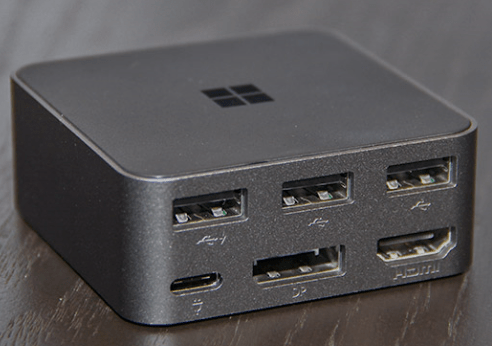 But yet, for some reason Microsoft chose to “not” support USB powered monitors when designing the Display Dock. Why? I may be way off here, but I’m guessing that in the near future, ALL monitors, except maybe those 27”+ 4k behemoths, will be powered by 5.0V USB. With all those USB ports, couldn’t Microsoft make one that would work with something like the monitor below. 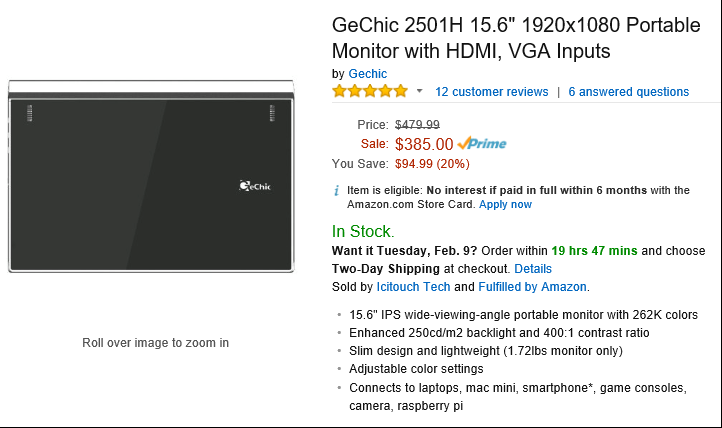 Resolution: 1920 x 1080, weight: 2lbs. , cables: a single USB cable for display and power. What’s not to like about that. And couldn’t you envision this displaying stuff from your Windows Phone. Rather than dragging out a 10lb. 21” display. And then using that unwieldy HDMI (my jumper cables are more flexible) cable to connect that heavy monitor to the itsy bitsy Display Dock, which will move around your desk, wherever that HDMI cable decides it should go. I don’t get it. As I shopped around Amazon I thought I had found a few USB to HDMI adapters, but then discovered that they basically don’t go both ways. So outputting USB video to an HDMI input, ok. But feeding HDMI back to a USB input, sorry Charlie. For now, that leaves me with an alternative like this GeChick below. Or this little guy, with a touchscreen. 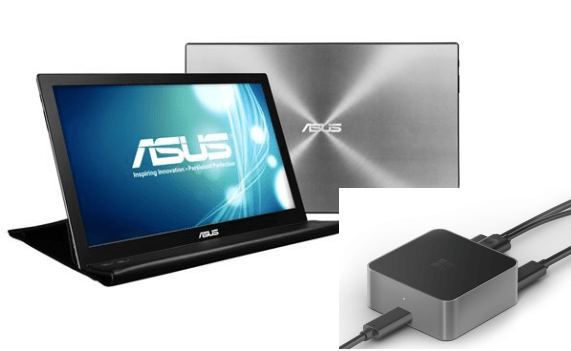 Three times the price of the Asus above. Hell, you might as well buy a Surface 3 and forget about Continuum. I don’t know if Microsoft can get the Display Dock to support USB monitors via a firmware update for the Dock as well as Windows 10 Mobile. If they can, I suggested they do that, today. If they can’t, I may just have to wait for the Display Dock 2. Duh!